My Wandering Life: Birthdays Galore! July 7th is a popular day to be born! At least among the people I know! My father in law, my friend Selena, and my friend Roger were all born on that day, decades apart. Two out of the three of them celebrated their big day at Disneyland, and since we have those convenient Annual Passes, we joined them! It was awesome for my kids to have other little kids to play with while waiting in line. Selena and her hubby Ron have three boys, but they left the youngest at home, bringing the six and four year old along for the fun. 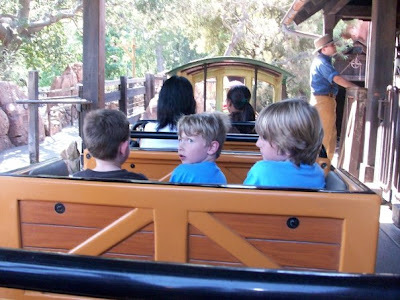 Ben and their oldest were thick as thieves all day, talking about who knows what, and he rode Big Thunder Mountain with my boys while I sat about three rows back and tried not to fret. Which was easy as I was riding with Ron, who was yelling like a maniac (and video taping us) the whole way. We are so blessed to know this family: Ron always answers his phone when I call, even though he knows it's generally because I need him to do something crazy like build me a set, perform in a sketch after one rehearsal, pick up a piece of furniture off the side of the road to be used as a set piece, or stay up all night light doing a a painting project. The world needs more men like Ron (and women like Selena), and I'm so glad they have three boys to raise as we know there will be at least three more amazing people out there making the world a better place. Happy Birthday Selena!